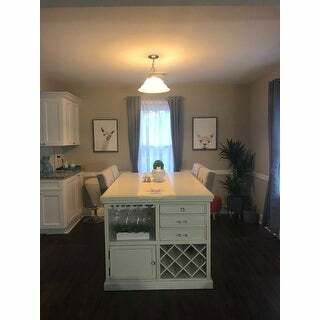 I love the looks and color, Had lots of good comments on the table I even bought a extra chair to make it 5chairs table and the end, Is very elegant for a open kitchen and takes less furnitures in the house, seems it includes the wine furniture, drawers are wonderful to put the table napkins and table cloths . Is just a luxury table for your home . Dine in style with this gorgeous Furniture of America Tia Transitional 5-Piece Counter Height Kitchen Island Table Set. Multifunctional and beautiful, this counter height dining table has built in drawers, a cabinet, wine rack and hanging stemware rack so you can keep items handy and increase your storage space at the same time. Dimensions 66.0 In. X 42.0 In. X 36.0 In. It is perfect for my kitchen I love so Much, when I order I am Very worry because normally I don’t like order too much online but when I received I like a lot, the quality is amazing, all my family and friends have to give a complement about my kitchen now!! We are very excited !!! The ensamble was very easy !! I really recomend this gorgeous kitchen island set!! Delivery process was a little stressful. The piece itself is great. Assembly required one person and went relatively smooth. One chair was a little off-balance but adding (small, adhesive) felt sliders seem to help balance it out, we'll see. Not a lot of space ("elbow room") between chairs but doesn't pose a real issue; Someone can always sit on the end of table. The chairs are wide and allows you enough "intimate" space. Finish is nice. Size is perfect. Overall satisfied. Nice and sturdy . I changed the handles as I wanted slightly lighter look than the dark ones it comes with . All in all a bit pricy but well worth the money for the quality and unique look if u like the island and bar height style . This was a great buy and very easy to assemble the only part I needed help with was Setting the table top on. 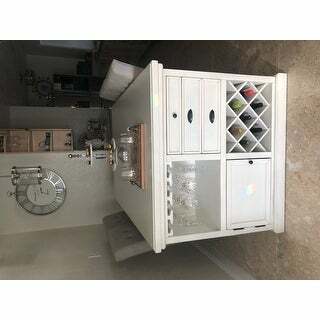 If I had space for it I would get the matching buffet I’ve gotten great compliments on it and it works well in my kitchen. Two screws were missing but they quickly sent replacement hardware. Item is true to color. This kitchen island is so beautiful. It looks amazing in my dining room. The quality is great, it’s made of real wood. Very sturdy. Love love love!! We love this piece. Built to last!! some of the screws don't fit easily to assemble the chairs. So I just had to leave them out. Overall I like the set. I wish it was not this light. It is lighter than what it shows in the pic. So it could get stained easily. But we are very careful with them. "I see dimensions on item 26209630 which looks like same table without chairs as 42 wide x 36ht x 66 it Yet the model 26190702 with chairs is 42 x36 x 36 or in your answer it in actuality 59.5 I'm completely confused. Please tell me if these items are the same or different and the actual measurements as it is important due to limited space area"
The table is the same for both pages and the correct dimensions are: 66”L X 42”W X 36”H. We have updated the incorrect information. The table is approximately 66 inches long x 42 inches wide x 36 inches high. The chair is approximately 19.5 inches wide x 21 inches deep x 42 inches high. The seat height is 25 inches and seat depth is 16.5 inches. "How wide is this table"
Seat Dimensions: 25 inches high x 16.5 inches deep. Counter Height Chair Dimensions: 42 inches high x 21.75 inches wide x 19.5 inches deep. Counter Height Table Dimensions: 36 inches high x 42 inches wide x 36 inches deep. The table is 42 inches wide. "how long would it take to put together?" The assembly time can vary but both table and chairs are ranked two out five in difficulty which shouldn't be hard to assemble in a timely manner. "What is the dimensions of the top overall length and width??" The overall dimensions of the tabletop are approximately 66 inches long x 42 inches wide. "I'm a bit confused by the dimensions on this. How deep is the cabinet/drawer area? How wide are the chairs and the seating area the chairs fit into? With the measurements provided, I don't see how they'd fit. Thanks! " The cabinet piece is 17 inches deep. The opening for the chairs measures 42.5 inches and both chairs fit under the opening.